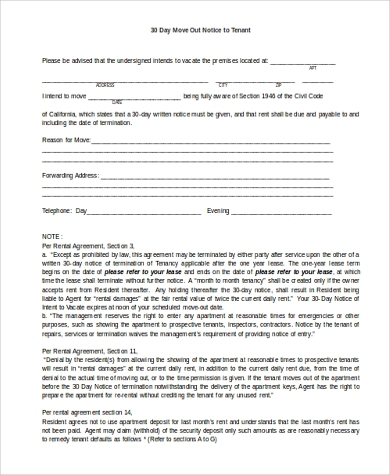 Notice Forms are generally the first step to any official change in a contract relationship. Here we will focus on a kind of eviction notice called the 30-day notice to the tenant. 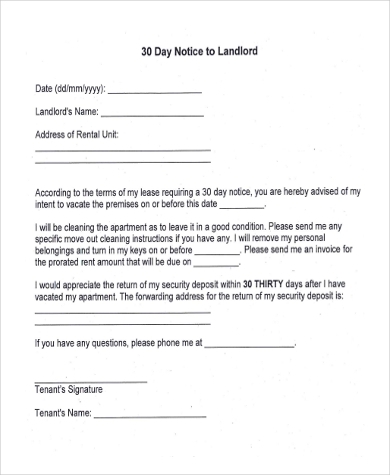 Landlords use such a form to formally tell a certain tenant to move out within or by the end of a month (30 days). This follows as either a final verdict to vacate the premises or as the consequence if the tenant does not remedy his/her violations of the lease contract. 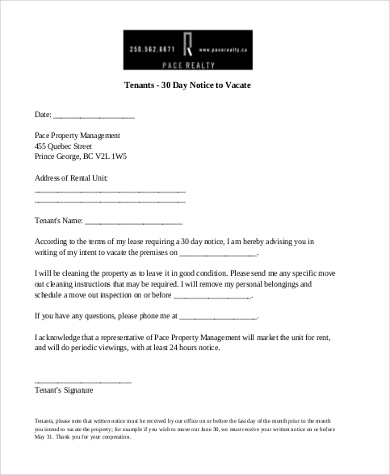 If you’re a landlord and need to vacate a tenant from the premises within 30 days or less, use these free samples as guidelines for your official notice. 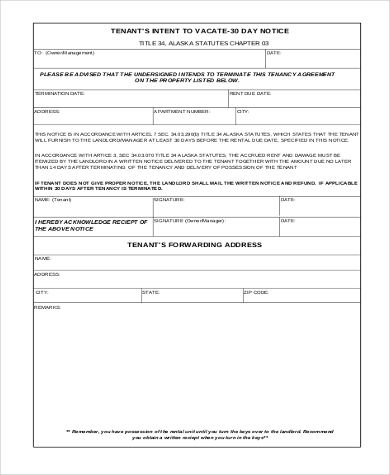 The notice you draft (or print directly) from these samples is only step one in the eviction process of a tenant. 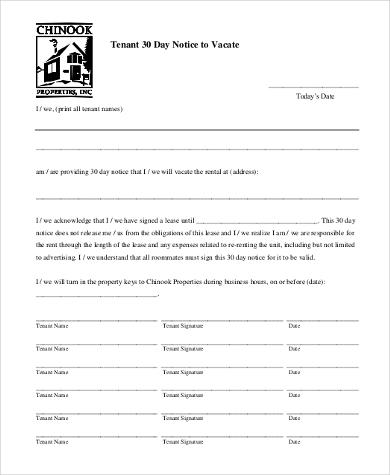 Not only does it streamline the eviction process, but it also establishes a record in case the tenant persists against the notice – in this case, you will need further legal action, with these eviction notices serving as evidence of your attempts. Use these samples when . . .
you have a valid reason to evict the tenant – you cannot actually kick a tenant out without a court order, so you need good reason, such as a major violation of the lease contract. 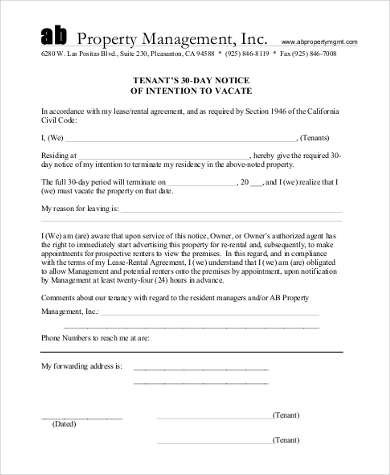 you have exhausted all the other smaller legal, formal, and informal measures to have the tenant remedy the violations to the contract conditions – this is in the case you are actually issuing an eviction notice as a corrective measure. The law in many states require such a notice of intent to be delivered . . .
Of course, 30 Day Notice Forms are but one type of official announcement. 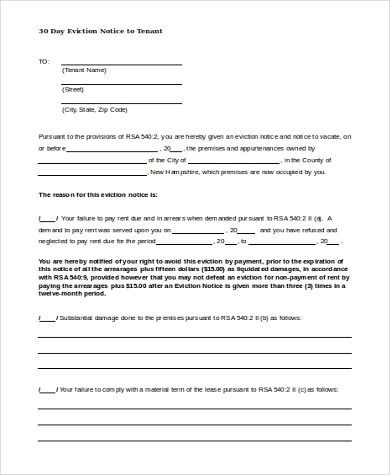 There are other situations where you will need a professional notice template. 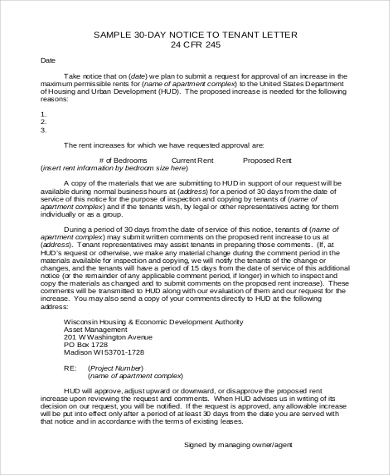 Tenants are often required by law to respond to these notices with a notice of intent to vacate, which basically confirms and agrees with the verdict to leave. Using the above templates, you can draft any of these forms, after all legal and informal action has taken place and the tenant persists.